Happy Halloween! After the regular meeting tonight we will carving pumpkins and voting on our favourites! Categories will include Best Design, Most Techy, and Most Original. You must bring your own pumpkin and a limited number of carving tools will be availible so please try to bring your own. 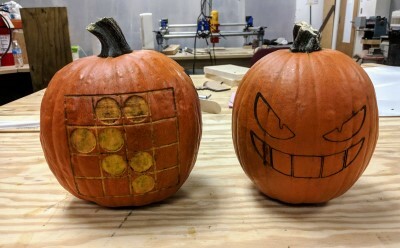 If you bring a small, pie size pumpkin you can engrave it with a custom design using the laser cutter like the two shown above!